These 5-day seminars are designed for those who have already completed a previous Ouray program with us. We maintain a 2:1 climber-to-guide ratio. We will not necessarily be climbing at a more technical level. Rather, drawing on our past experience, the group will move past some of the basic training quickly so that we can visit different and more varied terrain. We will attempt to climb in a new area each day, as conditions permit. Ouray, located in the San Juan Range of southwestern Colorado, is one of the few locations in the lower 48 states where quality ice climbing is virtually guaranteed in the winter months. A combination of good weather (285 sunny days per year), easy access to quality climbing, and the small, picturesque resort town setting have contributed to Ouray's nickname, "Ice Climbing Capital of North America." These programs are an excellent choice for those considering participation in an expedition or climb that requires confident cramponing in icy conditions. Focusing on the balance and technique necessary for climbing steep water ice gives one a real advantage when the going gets tougher. Upcoming IMG expeditions for which this seminar is useful training include Everest, Denali, Alaska, Mt. Logan, Aconcagua, the big peaks of South America and the Himalayas. For you skiers, ice climbing is the perfect complement to a ski vacation. Telluride is just 47 miles or an hour drive away from Ouray! Bring the family skiing, then come spend a few days training with us. A typical climbing day will start with breakfast at the hotel. Access to the Ice Park is a stroll across the street to the start of the box canyon. There are at least 11 distinct areas in the Ice Park with all levels of climbing and more than 150 named routes. The 3 day, 5 day, and private guided programs will likely visit "natural" ice outside the Park on Forest Service land. In the evening head to the hot tub or the hot springs pool in town to soak and relax, then finish with dinner at a local restaurant. Seminar instructors are selected from IMG's premiere staff of ice guides: Justin Merle, Andy Polloczek, Jonathon Schrock, Eric Remza, Marc and Sondra Ripperger, Ryan Dougherty, Max Lurie and other local experts. George Dunn still makes an appearance occasionally; it is too fun to miss! The focus of the programs will be on improving individual climbing skills and having fun ice-climbing. With a small instructor/student ratio there will be lots of close attention for all levels of climbers. Participants are encouraged to progress at their own pace and comfort level. Just a quick note to let you know how much we enjoyed the Ouray ice climbing. Sondra is a superb instructor; I learned so much from her about footwork on the ice, how to use ice axes, belaying, knots, etc. Most importantly we had a great time ice climbing and enjoying Ouray. The skills Chris and I learned of course will be useful on our Kautz climb this summer, but our Ouray trip was a big success on its own  great long weekend away from the office rat race. Thanks again for putting together such a good program with such a talented instructor. George Dunn and International Mountain Guides lead climbs outside of the Ouray Ice Park on land located on the Grand Mesa, Uncompahgre and Gunnison National Forests under special use permit from the Forest Service, USDA. Open to past participants of Ouray programs. We do not expect participants to be experts, but rather to have had previous experience and be ready to tackle different climbs in different areas. This is the ultimate fun Ouray program, drawing repeat visitors from many years back. Can't make any of our advertised programs fit your schedule? We offer custom climbs for any size group from 1 to 8. Rates are based on guide to climber ratio just like our regular programs. Fit your dates, skill level and group size to our guide ratio for the perfect program to suit your needs. We can accommodate any ability, from first time climbers, to family groups, to advanced ice climbers. Our guides will create the best possible experience for you in Ouray. For climbers looking to brush up on skills required for climbing Everest or any high, technical mountain, Ouray is the perfect training ground. Learn the best ways to efficiently ascend and descend fixed lines, cross ladders, and generally prepare for your upcoming expedition. While you're at it, have some fun ice climbing! The movement skills will greatly aid your climb through the Khumbu icefall or on the technical pitches of any big mountain. Get personal advice about your climb, your gear, and your training. One of our top Everest guides will show you the ropes, consult with you about your upcoming trip and help you to fine tune your skills and your equipment. Custom dates only, based on guide availability. 3-5 days recommended based on your needs. Available to climbers who have intermediate to advanced level skills and would like to do an all-day climb on natural ice at a higher grade. In the Silverton/Eureka area: Stairway to Heaven; Whorehouse Hoses; Goldrush and more. Please check with IMG regarding conditions and route availability as options change throughout the season. Recommended for first time climbers. 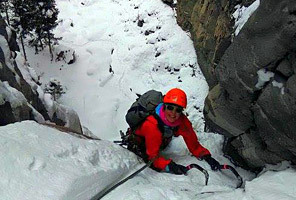 A great introduction to the basics of ice climbing in the close by and easily accessible Ouray Ice Park. If you aren't sure if you will enjoy ice climbing, try this first. You'll be back next year for a longer program! This is the recommended short program to get you started out right with a smaller guide ratio, more time to learn skills and practice them. A short program recommended for those who have taken an ice climbing program previously. Focus will be on climbing more routes on varied terrain and working on advancing skills. Open to all levels of experience, suitable for first time ice climbers AND repeat climbers. Participants are teamed up based on ability and learning styles. An in depth learning experience with lots of climbing and time to really improve skills.